Often when I think of the American Revolution I think of greats like George Washington, Ethan Allen, Patrick Henry or Paul Revere. There were hundreds of unsung heroes whose legacy hasn't been told, lost over time, or just thrown in with the rest of the war stories. All for Liberty takes a look at some of those heroes. The main character is Henry Felder, portrayed by his sixth generation grandson, Clarence Felder. Henry was a Swiss farmer in South Carolina, 1775. He tried to live his life in peace, and had hired a freeman during a time of slavery. Governor Rutledge comes to ask Henry to make more gun powder and to write a declaration of separation from the King. He also asks Henry to ready a militia in this area. Henry, despite his desire for peace knows he must stand for freedom. 1179 Charleston. Savanna Georgia has fallen and the British are coming toward Charleston. Though Henry's militia has been waiting here for them, they go back to their 'back country' to utilize the forest and water they are well familiar with. The British Torie star to build forts in the woods, pushing into the territory where Henry lives. 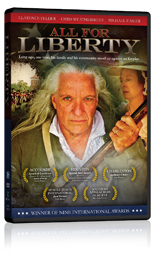 Despite his age, in a young mans' war, Henry fights along with his sons and neighbors. Part of this movie had a home movie sort of feel, rather than the huge production that we often see in revolutionary war movies. I did love how the movie had a realistic feel to it with all of the props being historically accurate (to the best of my knowledge). Flint lock Muskets, the forts, the period clothing, hair styles all helped us feel what it would be like in the American Revolution. I felt it was great to hear about some of the other people in the war, that we have never heard of. Made me think of how many more unknowns worked hard to secure our freedom from the British. This is a great movie to go along with a homeschool study on the war. It is suggested for ages 12 and up due to violence. It is 82 minutes in length. I received a copy of this movie from Bridgestone MultiMedia Group in Exchange for an honest review. My husband would really enjoy this movie.